The ‘All or Nothing’ boxing and kickboxing bouts took place last night [Oct 13] at the Fairmont Southampton, with a packed crowd cheering on Bermuda’s finest fighters as they took on overseas fighters. The title fight for the night was Bermuda’s Teresa Perozzi vs American Tori “Sho Nuff” Nelson, which saw the pair battle toe-to-toe, landing punch after punch. The very vocal crowd cheered on all the fighters, and a brief attempt by Nelson supporters to chant “USA USA” was quickly and heavily drowned out by the rest of the crowd chanting Bermuda’s name. In the end Perozzi kept her WBA Middleweight Belt and the WBC Middleweight Belt — that was once held by Nelson — remained vacant after the three judges decisions was announced. Vic Richmond saw the fight 97 – 93 to Perozzi, while the two other judges Lynn Carter and Claude Paquette scored the fight 95-95 each resulting in a Split Decision Draw. 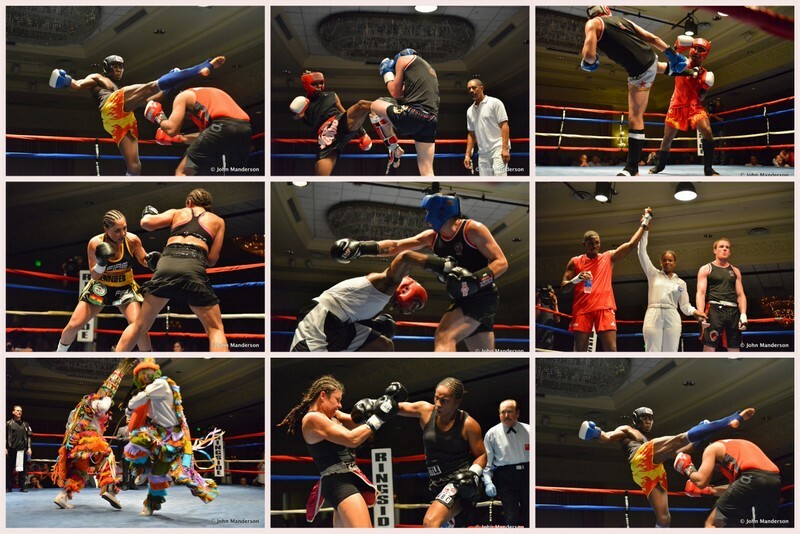 The night began with Danzil Smith face off against Jared Jimenez in an Exhibition match, which was followed by Stephen Wright defeating Deondre Burgess in the first Amateur Boxing fight of the night. Bermuda’s Shannon Ford then defeated Canada’s Mike Gale, before another Exhibition fight took to the ring as Nikki Bascome and Justin Garant put on a show for the large crowd. Corey Boyce defeated Khalid Pitcher in the first K-1 Kick boxing event of the evening, Jeron Gunness from Bermuda defeated his Canadian opponent Edward Pierce, and Bermuda’s Samir Furqan lost to Canada’s Anton Patockie. The AMTAC Intercontinental Middleweight Championship Belt was up for grabs between Bermuda’s Sentwali Woolridge and Canadian Daniel Kechecgo, both fighters hit the mat several times in the five round fight that saw Kechecgo declared the winner. Bolivian stunner Jennifer “The Bolivian Queen” Salinas defeated American Karen Dulin 60 – 54 on all three of the judge’s scorecards. Update: Multiple photo galleries and videos have been added, and all our coverage of the event can be found here. Impressive, what’s the purse for Terssa & Tori please? The fight did not end in a draw! 95-95. 95-95 and 97-93 to Perozzi equals a win for Perozzi! !